Gata4 deletion alters liver sinusoid morphology. 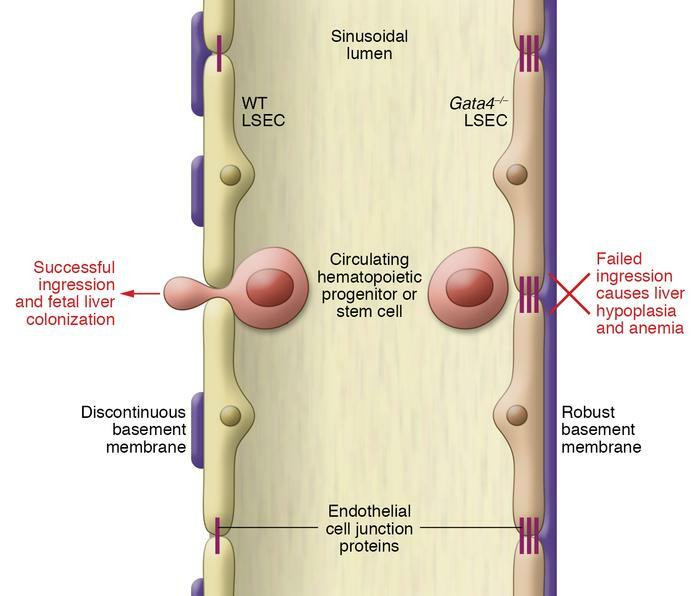 Genetic deletion of the transcription factor Gata4 from liver sinusoidal endothelial cells (LSECs) causes upregulation of endothelial cell junction proteins and robust deposition of basement membrane proteins that prevent circulating hematopoietic progenitor or stem cells from colonizing the fetal liver (11). The consequences of this transition from discontinuous sinusoidal to continuous capillary morphology are liver hypoplasia, anemia, and lethality of Gata4 mutant embryos (11).